Home Lifestyles	Take Five: What inspired a groundbreaking female journalist to enjoy life with her toes in the sand. Over the course of 20-plus years, Arlene Dillon was a groundbreaking female journalist and producer working for CBS News in Washington, D.C. She’s covered, produced and directed everything from 9/11, to the State of the Union address (the first woman ever) and CBS’s morning news show. But one day, while vacationing on Sanibel with her husband and walking the beach, she looked to him and said: What are we waiting for? Read all about her journey from the high pressure demands of broadcast journalism to life on Sanibel Island, which includes co-directing elementary school plays. 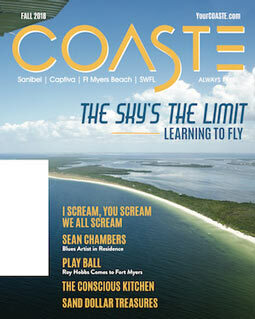 Just click here and be sure to subscribe to COASTE today! Community: How Sanibel’s farmer’s market started a trend that’s growing like crazy. Magazines: Your December-January COASTE is here for you to enjoy!